By 1985, scientists who studied ecosystems were very interested in process studies as a way to understand what controls the flow of nutrients in a system. In the late 1980s and early 1990s, Ecosystems Center researchers developed two models that were process-based, also called mechanistic models. Process-based models rely on ecological principles to predict future states of a specific system. Ecosystems Center scientists were particularly interested in creating process-based models to predict the impact of two changes on terrestrial ecosystems: rising concentrations of carbon dioxide and increased temperature. In 1991 Ecosystems Center researchers developed a process-based model called the Terrestrial Ecosystem Model (TEM). Jerry Melillo, David McGuire, and David Kicklighter from the Ecosystems Center collaborated with Berrien Moore, Charles Vörösmarty, and Annette Schloss from the University of New Hampshire to develop this model. TEM predicted how increases in temperature and carbon dioxide concentrations would impact the amount of carbon captured by plants at a regional and global level. Using data on soil, vegetation, temperature, and climate for more than 56,000 patches of land, TEM generated new data on the flows of nitrogen and carbon in land ecosystems. The Terrestrial Ecosystem Model helped scientists to predict the impacts of an increase in carbon dioxide levels, temperature, and both, on different types of ecosystems, from arid deserts to rainforests. Another process-based model published in 1991, called the General Ecosystem Model, predicted the long-term (up to 100 year) impacts of increased carbon dioxide and temperature on deciduous forest and tundra ecosystems. Ed Rastetter, who started as a post-doctoral fellow in 1986 and later became part of the scientific staff of the Ecosystems Center, led this project, and researchers Gus Shaver, Jerry Melillo, and Robert McKane contributed. Unlike TEM, the General Ecosystem Model used human-defined parameters, instead of data, to simulate carbon storage in land ecosystems. It specifically took into account the carbon and nitrogen ratios in plants and soils, which limit how ecosystems react to change. Center researchers calibrated the model to apply to the Long Term Ecological Research projects in Alaska and Massachusetts. 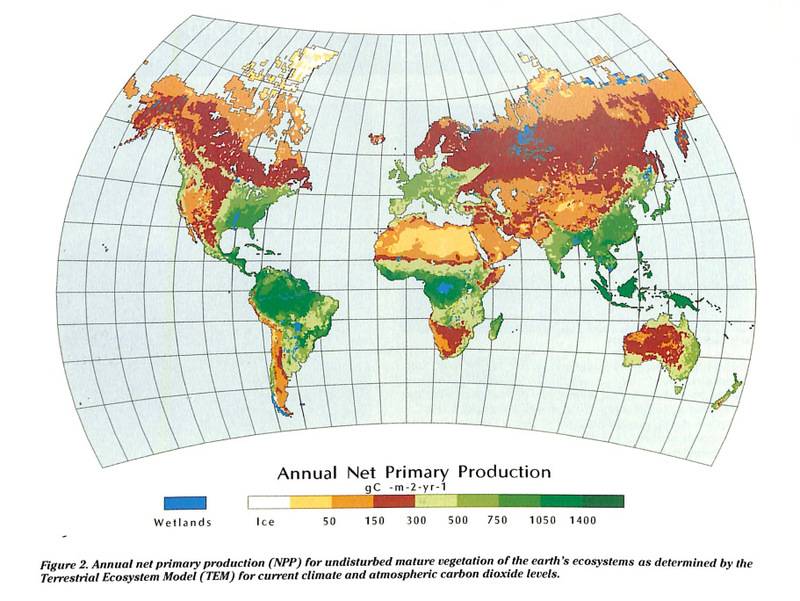 The General Ecosystem Model predicted that terrestrial carbon stocks are “strongly influenced” by the amount of nitrogen present in plants and in the soil.